A murder investigation is under way after a woman and three children, aged five to 11, were found dead in a house. Officers were called to the home in Cheadle Hulme, Greater Manchester, on Sunday night, after neighbours raised concerns about the occupants' welfare. Greater Manchester Police said they want to trace 36-year-old Rahan Arshad - the fifth person living at the house - who has been missing for four weeks. The dead woman and two boys and a girl are believed to be related. He may be driving a BMW 320 diesel M sport coupe, registration number SC06 HLZ. 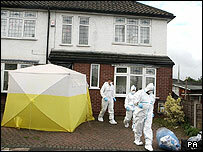 "We are keen to trace the fifth occupant of the house, Mr Arshad," Det Supt Bottomley said. "We are concerned for his welfare. We are treating it as a murder inquiry, therefore we need to speak to him. "There are a number of strands to the inquiry but the most immediate one is to trace the whereabouts of Mr Arshad." Mr Bottomley said a cause of death had not yet been established and post-mortem examinations were yet to take place. He added: "The bodies may have been lying there for up to four weeks and you can imagine in the hot weather we have been faced with a devastating scene." He appealed for anyone who sees the missing man to contact police immediately. "We have alerted every police force in the country. We want to speak to him in relation to the horrendous events in the house. 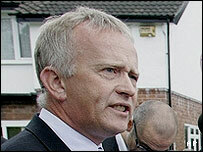 We are liaising with forces abroad," Mr Bottomley said. "If anybody has any information or sighted any members of the family up to four weeks ago, please contact police." Neighbours at Turves Road told BBC Radio Manchester that they contacted police when they saw flies around the house. Locals said the children living at the four-bedroom end-of-terrace house were thought to be of primary school age. 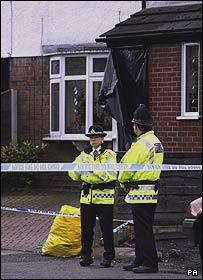 The property is cordoned off with police tape as scenes of crime officers carry out a search of the property. Winifred Lomax, 74, a retired shop worker who lives across the road, said: "They had not been seen for a few weeks and someone looked through their letterbox and there was a nasty smell."